Recorded as Hamer, Hammer, Hamor, and Hammor, this is a pre-medieval English surname. It has two possible origins. 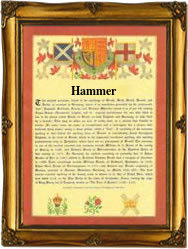 The first is locational from the village of Hamer, near Rochdale, in the county of Lancashire. The derivation is from the Olde English pre 7th century word "hamor" meaning a rock or crag. Most name holders in the north of the country are from this origin. The second source is early German, Flemish or Dutch, being a metonymic occupational name for a maker of hammers, or perhaps a user of a hammer, and deriving from the word "hamar" meaning stone. This is clearly an example of a transferred meaning, as hammers have generally been made of metals since at least Roman times. Early examples of the surname recording taken from surviving rolls and registers include: John le Hammer in the pipe rolls of the county of Sussex in the year 1332, whilst John de Heymer is recorded in "Baines History of Lancashire" in 1461. Katerina Hamer married Thomas Anderson, at St. Andrew's Enfield, in the county of Middlesex, on July 22nd 1560, and Ralph, the son of Ralph Hamer, was christened at St. Nicholas Acons, in the city of London, on February 16th 1589. Edward and James Hamer, who were Irish famine emigrants, sailed from Liverpool to New York aboard the ship "Windsor-Castle" on June 9th 1847. Throughout the centuries, surnames in every country have continued to "develop" often leading to astonishing variants of the original spelling.